A couple of weeks ago I started seeing this recipe all over the internet. It caught my eye for three reasons: it only has five ingredients, one of those ingredients is peanut butter, and it makes cookies. Sometimes I just want something to satisfy my sweet tooth without a lot of fuss. These peanut butter cookies fit that bill perfectly. With four ingredients that you’re almost guaranteed to have sitting in your kitchen right now, they’re perfect for whipping up on a weeknight, throwing together for last minute guests, or even for getting the kids involved in the kitchen. Warning: Peanut butter cookies may be hazardous to your pants. Oh, and if they weren’t hazardous enough on their own, I decided to get all experimental with them. 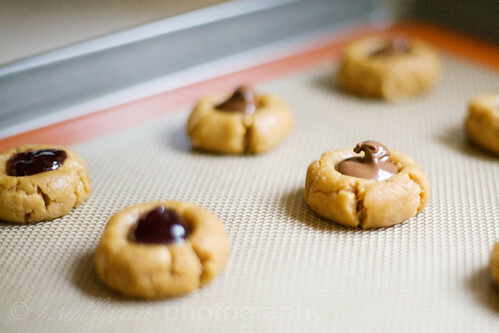 I baked half the batch like thumbprint cookies, filling half the centers with raspberry jam and the other half with Nutella. Oh yes, I did. Unfortunately the cookies didn’t come out as pretty as I’d hoped. I think I mashed down too much. But who cares? They won’t be around that long for me to look at because they taste too good! Line two baking sheets with Silpats or grease with butter. In a mixer, beat peanut butter and sugars until well combined, about 2 minutes. Add egg and baking soda. Beat for another 2 minutes until combined. Bake at 350° F for 10 minutes, or until lightly browned. No matter how good they smell, let the cookies cool for a few minutes on the baking sheet to firm up. Devour. These look perfect. 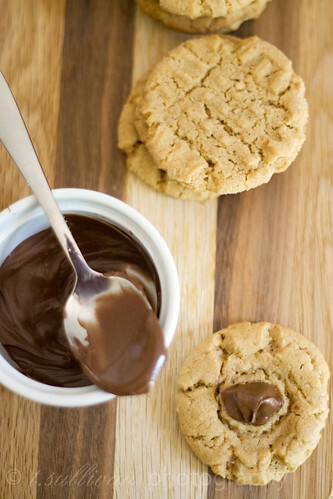 And all the more tempting with Nutella! How’s the texture like? It’s surprising how amidst all the jazzed up cookies out there, nothing quite pulls you back like pb cookies. I’m definitely giving this a go! I love peanut butter cookies. These look great. 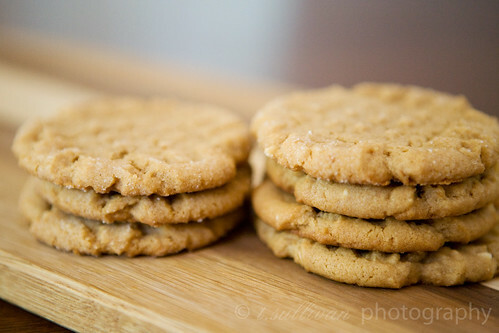 I made these with the only pb in the house at the time – my natural pb with cinnamon and raisins. They came out super soft and crumbly and stayed that way, even after storage, and weren’t bad at all! I would have rather used regular pb but didn’t have any on hand…will definitely try it again though, soooo easy! These look delicious – I may have to give them a try. Just curious though… what’s the deal with Jif exactly? I think we usually have skippy PB at home – now I’m paranoid about having inferior peanut butter! Thank you for clarifying – I feel much better now. :). It is my understanding afterall that choosy moms choose Jif – I’d hate to think they’d been mislead into choosing inferior PB.